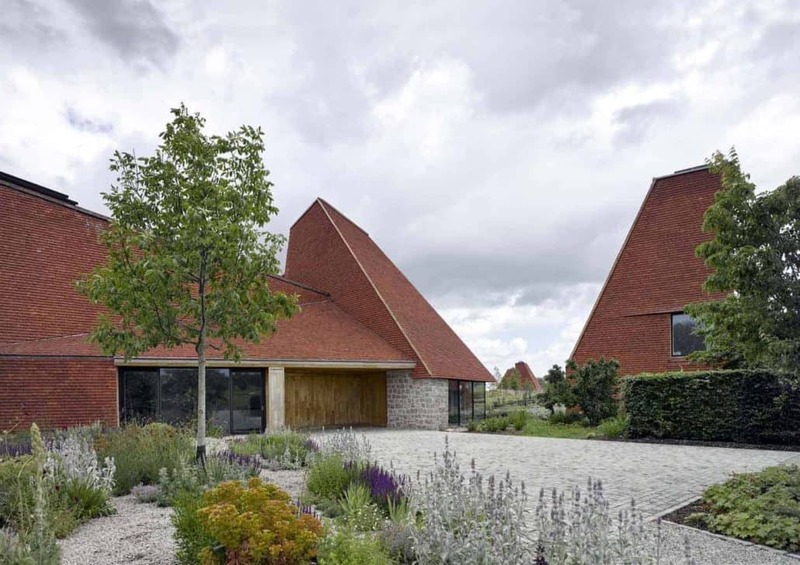 Inspired by the traditional oast houses of Kent, Caring Wood is a new take on the traditional English country house. It marries a bold and contemporary design with local materials, handmade roof tiles and high quality craftsmanship. This worthy RIBA 2017 award winner has clear links to its surroundings. It’s a manor house for the 21st century. 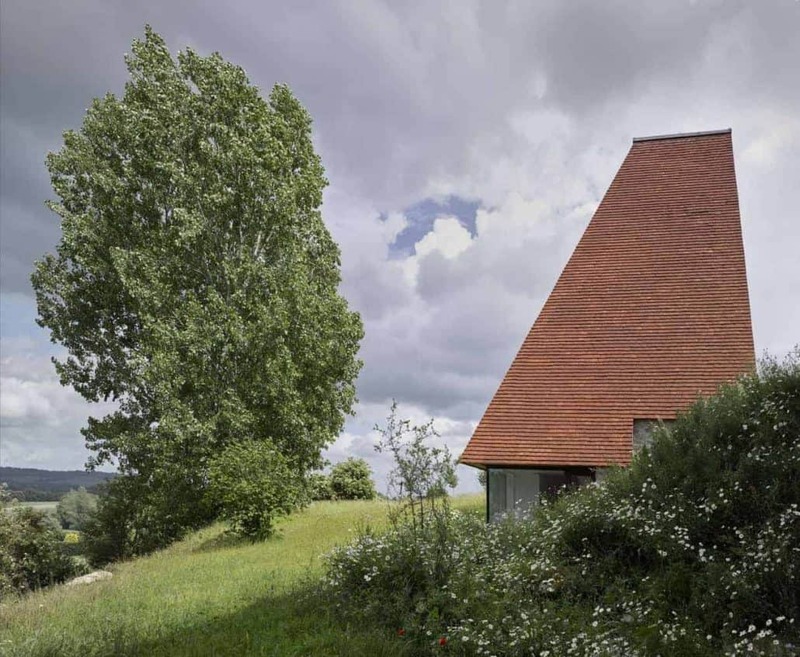 Caring Wood revives local building crafts and traditions including locally quarried ragstone, coppiced chestnut cladding and locally sourced handmade peg clay tiles from Wienerberger Keymer used to striking effect. The project was subject to a rigorous planning process to achieve consent under PPS7. Set in 84 acres, the Caring Wood brief was to create a carbon neutral building in the spirit of an English country house estate. The architects and their client set out to re-imagine what a home could be. As a result, they explored brave and highly relevant questions about and the family home and cohabitation to create highly original building designed to stand the test of time for generations. 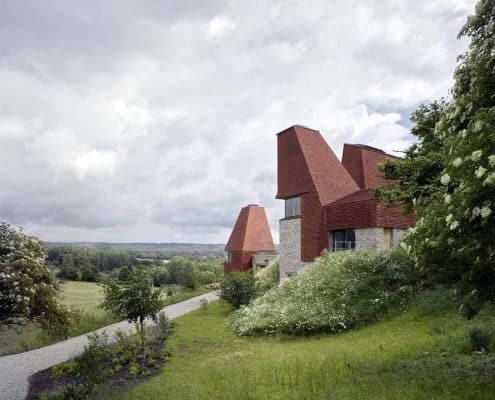 The relationship with the landscape takes precedence, with the central core and four oast towers growing from the contours of the hill. 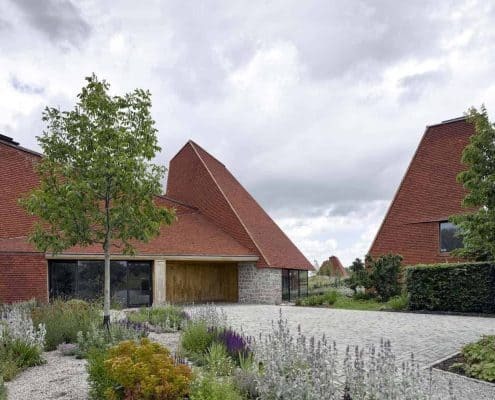 The language of the oast is used to provide a contemporary passive environmental response which results in a sculptural roof form with stunning architectural heritage and classic clay peg handmade roof tiles. 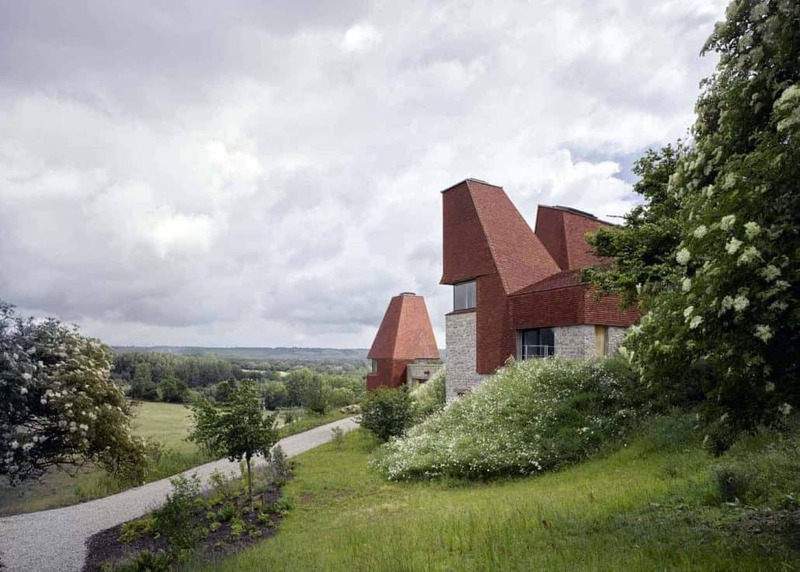 says Sebastian Cox, RIBA House of the Year 2017 juror. 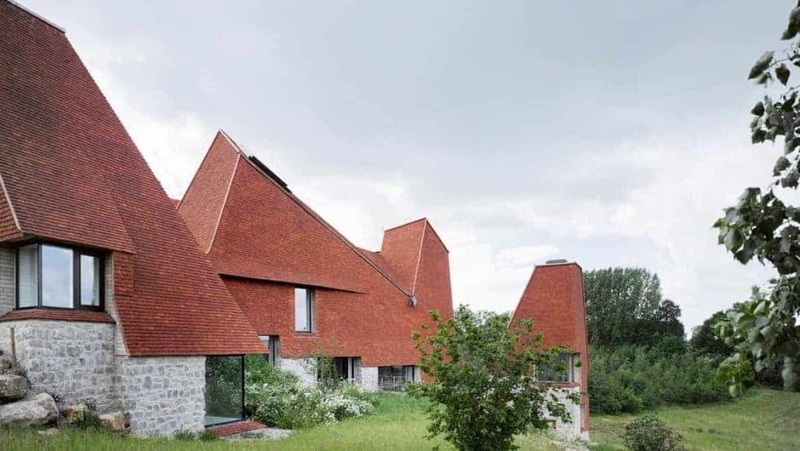 Plain clay roof tiles, laid double lap, have been used in England for roofing since before the Norman conquest. Handmade roof tiles dating back to Roman times have been discovered in archaeological digs. With the exception of South West Cornwall and the northern counties of Northumbria, Lancashire and Cumbria, evidence of early clay roof tile use can be found throughout most parts of England. 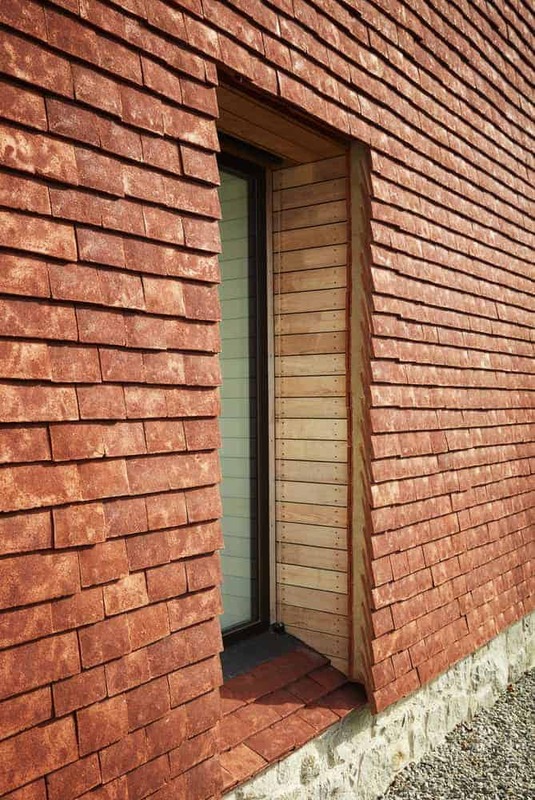 Clay plain tiles were usually made with fixing features. Most early handmade tiles produced in the Midlands were made with a single nib for hooking to laths. Early handmade clay tiles made in the Southern and Eastern counties were more frequently seen with two large holes, through which, hooking pegs could be secured. 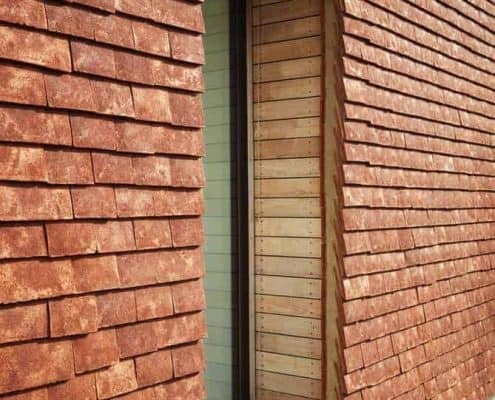 It is this type of tile, commonly known as ‘Peg Tiles’ which were hand crafted from clay and beautifully used on Caring Wood. If you like the heritage look, at AJW we source and supply a range of plain clay and handmade roof tiles and slates including Wienerberger Sandtoft and Keymer. 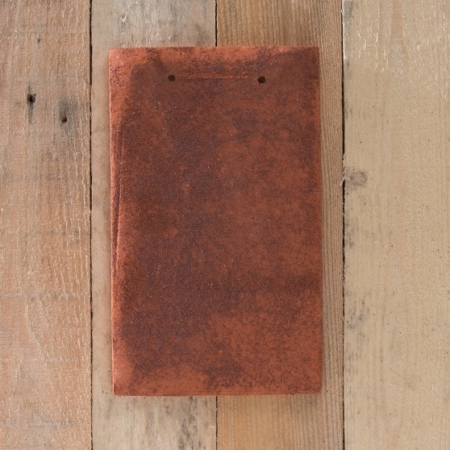 Our roof tile experts are on hand to help you select and specify the perfect materials to suit your project. Contact us or drop in to your local depot for more information.